Yogyakarta, or Jogja, is the second most densely populated tourist destination after Bali. Many tourists want to visit Yogyakarta to enjoy the atmosphere of a traditional Javanese. 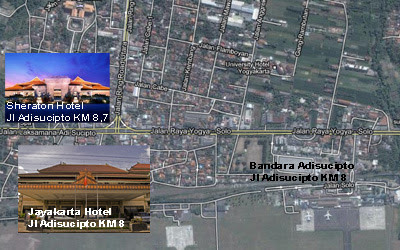 There are many tourist destinations as well as places to stay in Jogja, from cheap hotels for backpacker class, to the international five-star hotels. There are many ways to enjoy cheap holidays in Yogyakarta, from shopping around Malioboro street, going rafting in Magelang, enjoying a culinary tour in many angkringan and cat rice (nasi kucing) or going to Raminten to enjoy it's traditional culinary service, see Babad Kampung, visit Prambanan Temple to see Ramayana Dance performance, holiday travel to goa Pindul, Parangtritis beach, or a walk around the palace and the Taman Sari royal heritage site. Amanjiwo Resort, price start from IDR 10.200.000/night, Hotel Tentrem, price IDR 1.200.000/night, Melia Purosani Yogyakarta 1,250,000, Hyatt Regency Yogyakarta start from 1,000,000, Royal Ambarrukmo Yogya 900,000, Ibis Malioboro Yogyakarta 800,000, Novotel Yogyakarta start from Rp. 775.000, Shantika Premier Yogyakarta start from 825.000, Yogyakarta Sheraton Mustika 850,000, Hotel Jayakarta Yogyakarta start from 800.000, Hotel Inna Garuda start from 925.000, pop! Yogyakarta 500,000, Grand Aston Yogyakarta price start from 1,175,000 , Yogyakarta Cakra Kusuma Hotel 550,000, d'Omah Tembi Guesthouse start from 750.000/night, Tembi Homestay Yogyakarta start from 350 000/night.